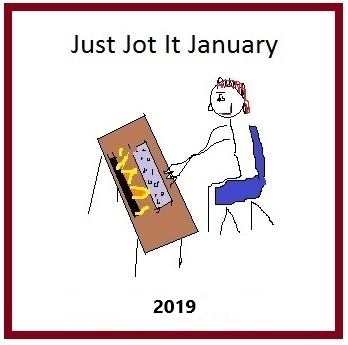 Linda gave the final prompt for this last day of Just Jot It January: “your favorite thing/part/blog post of last year or last month.” I thought I would write two brief responses. My favorite blog thing for the last month is that I actually managed to post every day this month. Given that my posting has been so sporadic for so long, this feels like an accomplishment. Bonus: It means that I am writing again, which had definitely fallen by the wayside over the last couple of years. I even have managed to write a few poems recently. Can I keep it up? Probably not the posting every day part, but I’m hoping to carve out some writing/revising time on a regular basis. My favorite in-person thing of the last month was the return of daughter E and granddaughter ABC from their four week visit with our son-in-law L in London UK . Sometimes in the past when ABC travelled, she would not immediately want to come to us, but this time she broke into a big smile, called out to us, and wanted hugs and kisses. This gives me hope that, when she and E re-locate permanently to the UK later this year, we will be able to keep our relationship alive via videochat. I knew this was possible if chats happened on a daily basis; ABC definitely knows that L is her daddy when they videochat. I doubt we will be able to orchestrate daily calls once they are all together in London, but it seems that weekly ones may be enough to keep us in ABC’s memory bank. Thanks to Linda for Just Jot It January and thanks to all the other participants! Write on! I’ve run into a bit of a hairy situation with Words with Friends. I’ve been playing for years with both in-person and longtime Facebook friends. Occasionally, I also play with some friends of friends who challenge me. WWF lets me know in those cases with whom these new challengers are friends. Lately, I’ve been getting challenges from people I don’t know. Some of them have a much lower word strength than mine. My average word is 21. Some have no average word strength listed. I start to send moves and then these guys start to chat. It tends to start with “Hi.” Then they may ask where I am from or start calling me “dear”. I don’t answer. I don’t talk to strangers online. I’m perfectly willing to play a game but I don’t want to divulge any personal information to somerandomdude27 or whomever. After a few moves back and forth without my answering the chat, these guys stop sending moves. This has all happened since I changed my Facebook profile picture back to a picture of me (and a suitcase) after several years of using a photo of me and B on E’s wedding day. Is it a coincidence that men started to try to chat me up on WWF after I changed to a solo pic? 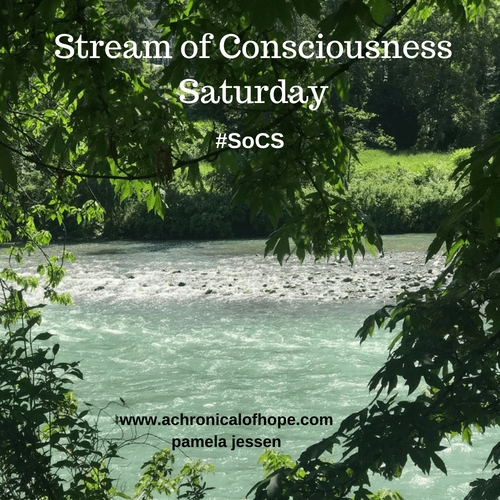 Author Joanne CoreyPosted on December 15, 2018 Categories blogging, musings, Stream of Consciousness SaturdayTags chat, facebook, friends, games, online, SoCS, strangers, Words with Friends, WWF7 Comments on SoCS: Words with Friends? “Ma” is one of the first syllables that babies say, often when they are sad or upset, which is a bit of a bummer for moms to whom this sound is usually attached. ABC is about to turn eighteen months, so we have been treated to the evolution of “ma”. Right now, it is the sound she makes when she is giving kisses, whether or not these involve physical contact. It is so sweet at bedtime or other times of the day when she walks or runs over to give a kiss – Mmmmmmmaaaaa! She and daughter E will leave mid-month to spend four weeks with dad/spouse L in London, where they will have holiday celebrations with her other grandparents, aunt, and extended family. We will miss them and ABC kisses over the holidays.